Disney Cruise Line is striving to give your kids what they want with their Disney Channel Summer at Sea Cruises. Many stars from popular Disney Channel shows will be on board the Disney Wonder and sail with guests. For eight nights, different stars will perform and give your kids a special opportunity to get close to their favorite Disney personality. Stars scheduled to appear so far are Tiffany Thornton, Doug Brochu, Brandon Smith, and Allisyn Arm from Sonny with a Chance, and Roshon Fegan, Alyson Stoner, and Meaghan Martin from Camp Rock. Jason Earles from Hannah Montana, Olesya Rulin from High School Musical, Jason Dolley from Hatching Pete, Chelsea Staub will be on board some ships. 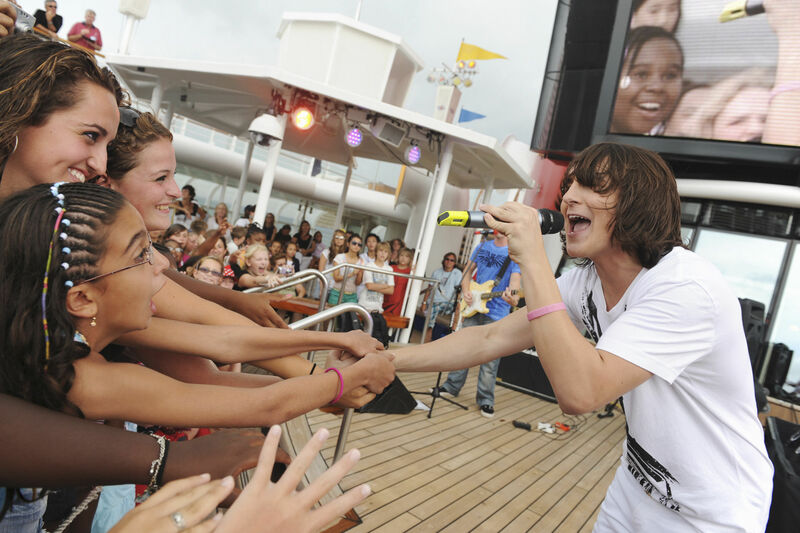 Nicole Anderson from JONAS, Debby Ryan from The Suite Life on Deck, Jennifer Stone from Wizards of Waverly Place and Musical Acts KSM and Mitchel Musso will also join a few sailings. Stars onboard will host deck parties, hold a Q & A session, be available for autographs, and attend Disney Channel screenings. The cruise will end with a Party with the Stars event where guests can join the Disney stars for a special live musical performance while Radio Disney broadcasts it live. Got family members who don’t get it? Disney Cruises have something for all ages to enjoy while out to sea. With Disney’s Oceaneer Club, kids 3-7 can have fun playing games inspired by Peter Pan or learn to dance with the help of Snow White in this program run by trained counselors. Your teen can hang in Aloft, a teen only hangout that has a big-screen plasma TV, video games, music, a lounge area, and an Internet cafÃ©. Even dining will be fun for your family in the Disney themed restaurants on board. At Triton’s, your family will enjoy seafood in an elegant underwater-styled restaurant named after the king from Little Mermaid. Or have dinner at the Animator’s Palate, a restaurant designed in celebration of animation. You will be surrounded by drawings and animations of classic Disney films as you and your family dine. Parents can also enjoy adult-only activities like the spa, salon, fitness center, and the array of nightclubs and lounges. They can relax in Quiet Cove Pool, an adults-only area with two whirlpool spas and a poolside bar that has a variety of drinks and snacks. There is a formal adult-only restaurant, Palo, that wraps parents in romance and elegance while they savor Italian cuisine. If you have an infant that needs to be watched, take her to Flounder’s Reef Nursery, a babysitting center for babies 12-weeks to 36-months-old designed in an underwater style. Your children will be watched by trained Disney caregivers who give parents pagers so they can always be in contact with them. Your child can be watched for 10 hours maximum at $6 per hour for one child and $5 per hour every additional child. The Disney Channel Summer at Sea Cruises are available for a limited time for a three or four night itinerary in the Bahamas between July 9 and August 2. Rates start at $679 per person based on double occupancy for a category 12 inside stateroom. Also from June 20 to August 9, 2009, if you book a verandah stateroom you’ll get $100 a day in onboard spending credits which can be used for spa treatments at the Vista Spa and Salon, shore excursions at ports of call, shopping onboard the ship, and on Disney’s private island, Castaway Cay. Remember, these are all cool sailings. More stars will be announced at a later date and this current lineup could change without notice. To find out more about this cruise and see an updated list of performers go to www.disneycruise.com or call 888/DCL-2500.